this means the days are getting so much lighter and warmer. I've been quite busy in the garden ( it needed it), cutting back lots of shrubs and trimming tree branches etc. We've also been painting the Laundry & Bathroom. Neither of us are that inspired to paint every weekend, so its going to be a slow boat to China. However after 2 years of trying to choose a colour scheme, I think we've finally found the colours for the living room - praise GOD !!! (30 test pots later !!! ) The shade here in the bathroom is 'Puhoi Half' - by Resene. I've also discovered that my style has changed...well more, come back home I should say. I used to love 'country' decorating many years ago, back when I was a young wife and mother, then I moved completely away from it, but now with more time to think and be creative, I find its the style that resonates most with my soul, and I've moved back to its welcoming warmth. I painted this little shelf white and put it up in the laundry (so far its been dark blue, light blue and now white lol). Then I unearthed this little shelf from my shed, dusted it down and put it in what I call my little Amish room..In it are all my travel momento's and gifts from America. I've also taken up cross-stitch again. I completed a fairly large one, which I started back in 1993 !! !, finally the desire returned (or maybe the time) to finish it. I love how it turned out, and as it fits with the decor the Amish room, its in there too. decorated it..and made little pockets etc inside for my crosstitch scissors, needles, magnifying glass etc. It was a little fiddly, but I'm very happy with the end result. This is a my felt needle case I've had for many years. A friend did the emboridery. We I used to be in a craft gorup as a school fund raiser for many years, and we made things like this and sold them once a year at a craft Fair. 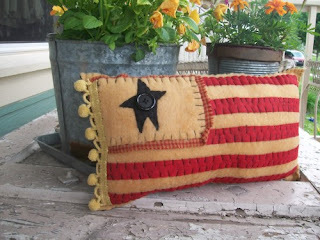 I saw this pretty cushion for sale online, but sadly she doesn't ship to NZ :(.. anyway her blog site is : http://www.artfire.com/modules.php? if anyone else wants to shop there. AND now to CANDLES etc...Some of my lovliest memories of travelling in America were visiting Primitive/Country style stores, especially in OHIO...!!! As soon as I stepped into the store I was met with a delightful aroma, of cinnamon, pine and spices from the huge array of scented candles and oilsI brought a couple of the bottles of the oils (Old Glory and Log Cabin) to take home with me to create that smell in my own home. Just taking the tops off the little brown bottles immedietly takes me back to those stores....ahhh. I also loved all the little 'electric fake candle lights' - that sat on window sills in shops and homes. They looked so welcoming and warming...especially when driving by on a snowy day or coming in out of the cold. Even some little coffee shops in OHIO had them propped in the windows. It was absolutely magical. I felt like I had gone back in time when life had a slower pace. I did buy one and brought it home, but my electrical adaptor didn't work how it was meant to and the wires burned out :0(. But as I was surfing the net the other night I saw that the 'Lehman's' store in America sells battery operated ones..!!!! Why didn't some one tell me about those. If I get to go back some time, I'll buy that sort. I bought this book at a Christian Book Shop here in NZ, when I was in Tauranga visiting my daughter - for some spiritual nourishment., 'Amish Peace' about Simplifying life......Its a bit like a devotional book..short little segments of about 2 pages..so enough to read just before to go to sleep at night.. ...AND...I couldn't resist this retro style cookbook.. 'A Good Spread' - A collection of recipes dating back to the 50's from New Zealand housewifes/country womens insitute farmers wives..The pictures etc are delightful and the recipes simple and tempting. 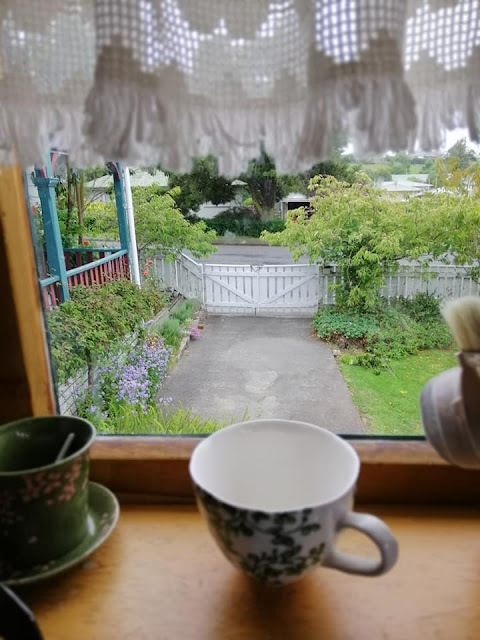 My kitchen has a view over the garden, so its a lovely place to cook in . Love reading your blog Linda. You are a wonderful writer & such an inspiration to me. Thanks for stopping by Hannah..its so fun having a blog page..(no committment attached really), just a place to share what I'm up to etc...The sad thing though is because I'm not on myspace anymore, I don't get to see what you ladies are up to :0( except on your facebooks :0) - hugz to you!